TOKYO--(BUSINESS WIRE)--Toshiba Electronic Devices & Storage Corporation (“Toshiba”) today announced development of an image recognition SoC (System on Chip) for automotive applications that implements deep learning accelerator at 10 times the speed and 4 times the power efficiency of Toshiba’s previous product. 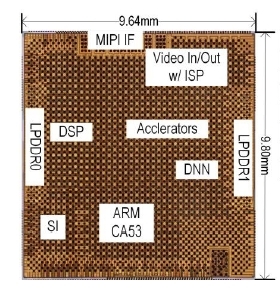 Details of the technology were reported at the 2019 IEEE International Solid-State Circuits Conference (ISSCC) in San Francisco on February 19. Parallel MAC units. DNN processing requires many MAC computations. Toshiba’s new device has four processors, each with 256 MAC units. This boosts DNN processing speed. Reduced DRAM access. Conventional SoC have no local memory to keep temporal data close to the DNN execution unit and consume a lot of power accessing local memory. Power is also consumed loading the weight data, used for the MAC calculations. 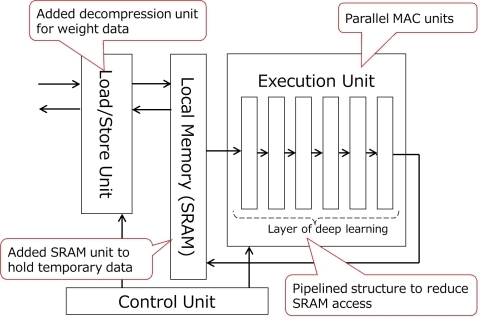 In Toshiba’s new device, SRAM are implemented close to the DNN execution unit, and DNN processing is divided into sub-processing blocks to keep temporal data in the SRAM, reducing DRAM access. Additionally, Toshiba has added a decompression unit to the accelerator. Weight data, compressed and stored in DRAM in advance, are loaded through the decompression unit. This reduces the power consumption involved in loading weight data from DRAM. Reduced SRAM access. Conventional deep learning needs to access SRAM after processing each layer of DNN, which consumes too much power. The accelerator has a pipelined layer structure in the DNN execution unit of DNN, allowing a series of DNN calculations to be executed by one SRAM access. Toshiba’s new image recognition SoC for automotive applications has DNN accelerator to enhance the power efficiency and the processing speed.